2.9" x 3.6" stitched on 14 count. 2.2" x 2.8" stitched on 18 count. 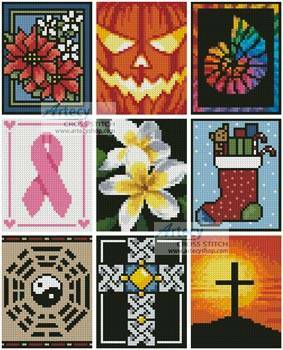 Cross Stitch Card Collection 2 cross stitch pattern... This counted cross stitch pattern contains 9 different 40w x 50h tiny designs which would look good on greeting cards. Designs by Artecy Cross Stitch. Only full cross stitches are used in these patterns. It is a black and white symbol pattern.